In the grand scheme of things, ten years isn’t an awfully long time. A decade can skip by, seemingly in the blink of an eye. That’s in the real world. In the art world, a decade is more like an eternity. In ten years Jackson Pollock went from starving artist to international celebrity – to dead. Thomas Kinkade (Inc.) went from being one of the best-selling painters in the world to bankruptcy court. In one decade, Vincent van Gogh created his entire body of work. In the art world, ten years can be a very long time. 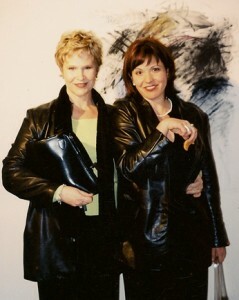 All the more reason, then, to celebrate Sacramento gallery JAYJAY’s 10th anniversary this month. JAYJAY, for the uninitiated, is perhaps the city’s preeminent commercial gallery. Boasting a solid stable of nearly thirty highly collected artists, including many faculty members from the art departments of area colleges, JAYJAY is on the leading edge of Sacramento art, specializing in modern and postmodern work. 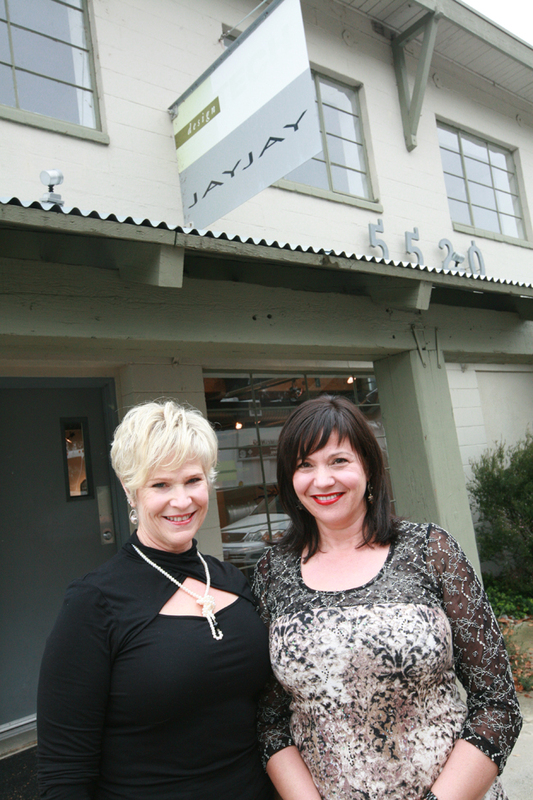 The brainchild of gallerists Beth Jones and Lynda Jolley, JAYJAY has served up some of the region’s most ambitious contemporary art since the gallery’s nascent beginnings in a funky storefront on Franklin Boulevard – a far cry from the swank East Sac digs they’ve occupied since 2002. Jones and Jolley describe the birth and growth of the business as a largely unplanned and organic process. At the time of JAYJAY’s opening, Jones already had her own successful art consulting company, a business that continues to thrive in conjunction with the gallery today. She had hired Jolley in the late nineties, and the two quickly discovered that they worked well together; when artist Gale Hart mentioned that she was moving out of her Franklin Boulevard storefront studio, opportunity knocked loudly. “There was that sweet space over on Franklin Blvd,” Jolley says. “What were we supposed to do?” At first the shows were open Saturdays and by appointment only, and were badged as ‘Beth Jones and Lynda Jolley Present.’ In January, 2001 they officially became JAYJAY. Their timing was perfect. Jones and Jolley quickly built a stable of respected local artists like Joan Moment, Galelyn Williams and Mary Warner, and have continued adding to their roster ever since. “When we think about what JAYJAY is, it’s the artists that we exhibit,” says Jones. Most of the artists who came on board in those early days are still with JAYJAY, including the very first artist they signed, Peter Stegall. “Peter was how I got onto abstraction,” Jones remembers. Looking for artists to fill a commission for a consulting job, Jones had followed up on a recommendation to check out a show of Stegall’s high modernist geometric paintings. “I’d always been more [interested in] narrative, that’s the kind of work I liked, [but] I was looking at a striped painting of Peter Stegall’s… I sat there looking at it and I thought, ‘oh, that’s something that’s never happened to me before.’” The encounter was transformative, and helped push her toward the nonrepresentational art for which JAYJAY is best known. Jones’ route to becoming a gallerist was a bit more circuitous. “I grew up making art, and I made art into my twenties, and then I was a poet, so whatever I’d pursued professionally or academically was nothing that was gonna make any money.” After studying art at Sacramento State she landed an office job in Jerry Brown’s administration and later worked for the Republicans when George Deukmejian was elected. By 1984 she had decided to leave – she wanted to have her second child, and working for the new administration wasn’t nearly as much fun. A friend recommended she talk to Maria Alquilar, the owner of the Jennifer Pauls Gallery. “Maria had recently moved into the same space with Mike Himovitz – 1020 10th,” Jones remembers. “She was having a hard time because Mike was very charismatic and strong and he was a business person… and Maria was very eccentric.” (“An artist through and through,” Jolley chimes in.) “So I came to work for her – and I have to say, my first day I thought, ‘oh, I could do this.’ I really loved it.” Before long Jones was a partner in Jennifer Pauls, and has worked in the art field ever since. At JAYJAY the Himovitz connection shows in the quality of art, of presentation, and even in the art itself. Jones and Jolley favor professional, academically-driven, intellectually nimble modern and postmodern art not unlike the work the Himovitz Gallery was known for. 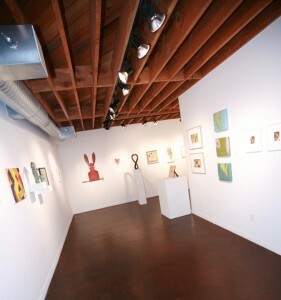 This type of art once held a strong place in the region (due in part to Himovitz’ influence); today JAYJAY is among the last few survivors of a once-thriving group of Sacramento galleries that specialized in high end modern and postmodern work. That JAYJAY has endured, especially through the recent recession, is a testament to Jones and Jolley’s hard work – and to the quality of their vision. It’s not surprising that Jones and Jolley are successful gallerists; talking about and looking at art with them is fun – their enthusiasm is palpable. And, their vision for JAYJAY has been amazingly cohesive since the day they opened the doors. Jolley’s explanation is simple: “99.9% of the time, for Beth and I to mount an exhibit, we’ve both got to want to have it in our collection.” That coherence of vision invokes trust in the artists who show with JAYJAY, and in the collectors who buy from them. That consistency of vision will be on view in JAYJAY Now and Then, the gallery’s celebratory 10th anniversary exhibition. For the show, Jones and Jolley asked each of their 28 artists to provide both a new piece of work, and a piece that is around ten years old. The idea is to “show where JAYJAY started and where we are at this point,” says Jones. 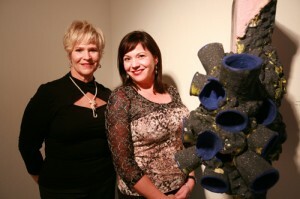 While both Jones and Jolley had significant experience selling art before opening JAYJAY, they have continued learning over the past ten years. The most important lesson? “It’s just as hard to sell a $10,000 painting as it is to sell a $200 painting,” says Jolley, laughing. JAYJAY’s patrons include some of the region’s most prominent collectors, and even other gallerists. Lial Jones, Director of the Crocker Art Museum, has acquired pieces for the museum – and her own collection – through JAYJAY and Beth Jones’ consulting company. Both Jones and Jolley cite placing Steven Kaltenbach’s iconic Portrait of My Father in the Crocker’s permanent collection as one of the high points of the last ten years. “I’d tried to get the Crocker to look at Portrait of My Father before Lial and Scott [Shields] came on the scene,” Jones recalls. “I curated this little gallery out at the church where it was hanging – Warehouse Ministries, Gallery W… I saw it all the time.” She was unable to interest anyone at the Crocker in the painting – until Lial Jones and Shields arrived. Jones and Jolley arranged a visit to Warehouse Ministries with Shields and Lial Jones to see the piece. “It took five minutes,” Jones says. “LESS than five minutes,” Jolley corrects. An inventive donation box funding system was negotiated to help the Museum pay for the work, and now, eight years later, Portrait of My Father is the single most-visited artwork in the Crocker. 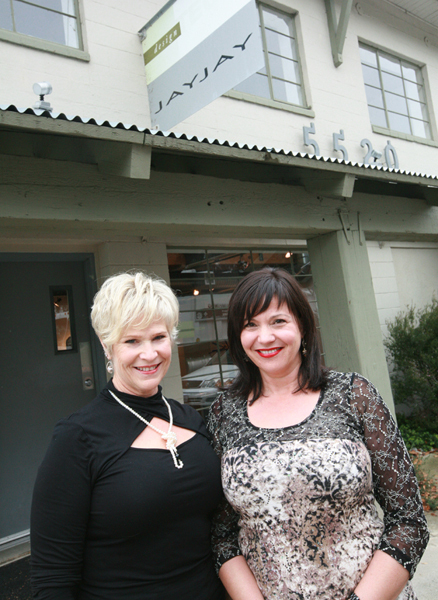 Today, Jones and Jolley cherish their roles as area tastemakers. “We are educating the region,” Jones says, unequivocally. Indeed, JAYJAY functions as a window into a world that is the norm in major art centers, but that most Sacramento gallery patrons rarely see – a world of challenging, non-narrative contemporary art made by professional artists. It’s a world that Jones and Jolley are passionate to share.